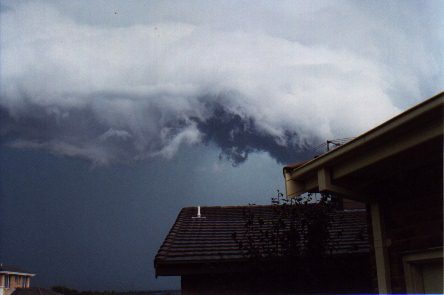 These photos were both taken at Blackbutt around 4:30pm on the 15th February 1998. This storm was the second of the day, with the first passing through around 2:00pm. 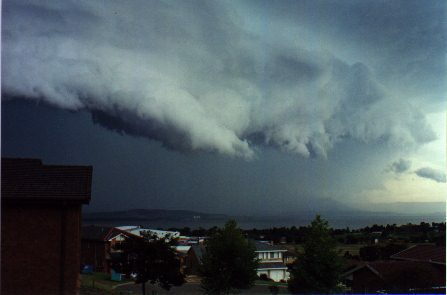 The first storm was not as spectacular to watch in its approach, or its fury. As it ended, the beginnings of the second storm could be seen by looking NW over the escarpment towards what must have been the lower Blue Mountains area. This second storm began darkening the sky at around 4:15pm. I wish I had thought to stay outside and watch it build as I probably would've been more prepared and ready with a zoom lens. Anyway, the storm approached from the northwest, very rapidly. Around the Mt Kembla area there seemed to be a small area of quite strong wind, and on talking to people who live near the area it is believed that something passed through the area just west of Mt Kembla. This was possibly confirmed when on a training run the following Wednesday I observed a narrow path (50-75 metres) in the bush where tree debris was stacked high on both sides of the road, with some quite large branches and some trees down, but this is an unpopulated area. All Illawarra suburbs west of the lake, and south of Unanderra seemed to have received hail. Interestingly there were no reports of damage or media coverage of the storms the next day. This is despite what seemed to be a rapidly swirling formation that crossed the surface of the lake. Much to my chagrin my camera refused to fire at some critical moments, being the lake incident mentioned above, and just after the leading edge of the storm passed overhead. It had to be the deepest blue-green cloud that I've seen in my limited experience. Dammed automatic cameras!